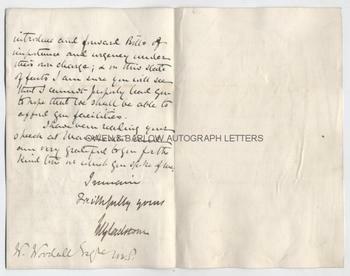 WILLIAM EWART GLADSTONE autograph Letter Signed. British Liberal Statesman who was four times prime minister (1868-74, 1880-85, 1886 and 1892-94). ALS. 2pp plus integral blank leaf. 10 Downing Street, Whitehall. February 21st 1885. To W[illiam] Woodhall. Together with a fine contemporary portrait photograph of Gladstone. "Leveson-Gower has mentioned to me your conversation with him the other day on the subject of the possibility of your obtaining facilities for bringing on your Bill. I am afraid I cannot give you any encouragement in this head. 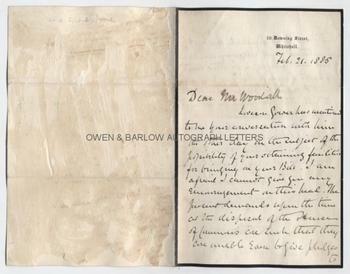 The present demands upon the time at the disposal of the House of Commons are such that they are unable even to give pledges to introduce and forward Bills of importance and urgency under their own charge; and in this state of facts I am sure you will see that I cannot properly lead you to hope we shall be able to afford you facilities. I have been reading your speech at Manchester and am very grateful to you for the kind terms in which you speak of me." 8vo. Approx 7.5 x 4.75 inches. Mounting traces and very slight mounting damage to verso of integral blank leaf, else fine. 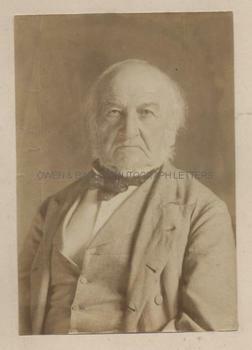 The portrait of Gladstone is an original, contemporary albumin photograph showing him in typical pose, fixing the camera with an austere and somewhat pugnacious gaze. It measures approx. 6 x 4 inches and is mounted on card from the original album leaf. It bears slight creases which were present prior to being laid down by the original 19th century collector. 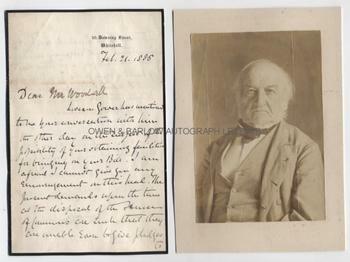 Both the letter and the photograph are from a collection made by the Liberal radical MP, William Woodall who held political office under Gladstone. He was leader of the Women's Suffrage Party in the House of Commons and several times attempted to introduce a private member's bill giving votes for women. The Franchise Reform Act of 1884 had failed to make any provision for the enfranchisement of women and the whole question of women's suffrage had been thrown back into the "never-never-land" of extra-parliamentary action. The Bill referred to in this letter is Woodall's attempt to amend the 1884 Act by introducing provisions which would give the vote to some classes of women. He failed in this but was to make several further attempts, none of which came to fruition. Gladstone's attitude towards this, as expressed in his letter, are interesting and perhaps surprising to the modern reader. Gladstone took the view that, though unfortunate, the whole question of women's suffrage was not an issue of huge significance or importance.